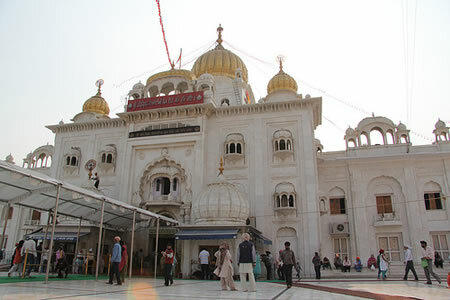 When traveling in India, I had the opportunity to visit a lively Sikh temple in New Delhi. It was a completely new and amazing experience. The Sikhs are extremely gracious in welcoming visitors and helping them to understand the Sikh religion and customs. Visiting a gurdwara, the Sikh meeting place for worship, is open to everyone – regardless of beliefs, caste or color. Based on my experience, here are some guidelines to follow for a respectful visit, and notes about what to expect. Like any other sacred space, you will want to plan on dressing modestly when visiting a Sikh temple. It’s best to wear loose-fitting clothing as you may sit with others on the floor in the main prayer hall. The Sikh temple I visited had a reception area for visitors. There was staff on-hand to welcome and educate visitors, and to loan them a head-covering cloth if they did not have one. The representative I met was delighted to share information and answer all my questions about Sikhism before I entered the temple. Any trepidation I may have felt about entering this unknown world were completely wiped away by the hospitality of the first Sikhs I met. Everyone must cover their heads before entering the gurdwara. 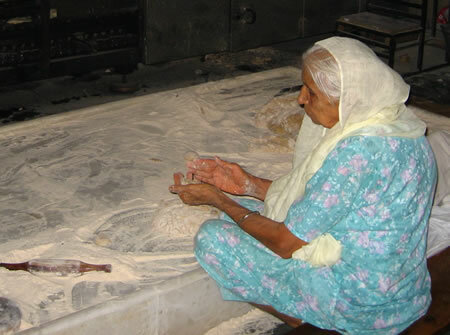 Sikh men customarily wear turbans, while Sikh women typically wear head scarves as part of their traditional dress. If you do not have a head covering, inquire about borrowing one when you arrive at the temple. During my visit in Delhi, there were large bandanna-like cloths available to use. Remove your shoes and wash your hands and feet. Many gurdwaras have a fountain or small moat just outside the entrance of the main prayer hall. It is customary to remove your shoes here and place them on the shoe racks provided, and wash your hands and feet. Mere steps from the chaotic streets of Delhi, this small ritual upon entering brought an immediate feeling of peace and tranquility as I stepped inside. In the main prayer hall, be aware of the Guru Granth. Entering the main prayer hall, I found an immediately uplifting and soothing feeling. Musicians playing traditional Sikh devotional music filled the room with a beautiful sublime song. Many sat and prayed on rugs on the floor, while others bowed and placed offerings before a raised platform containing the Guru Granth (the holy book). I sat cross-legged and felt the positivity of the atmosphere, being careful not to point my feet towards nor turn my back on the Guru Granth. During a worship service, women and men each sit on a different side of the room. Langar is a beautiful tradition that takes place every day in every Sikh gurdwara around the world. Langar refers to full vegetarian meals that are funded and prepared completely by volunteer worshipers and served to anyone who wishes to partake in them. 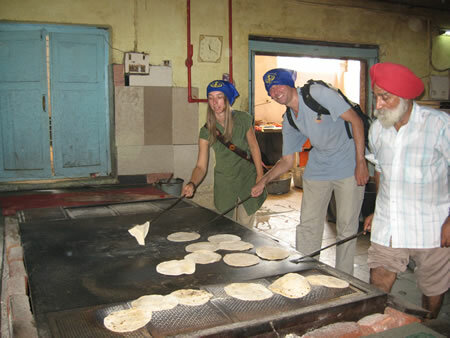 In the langar kitchen, I was welcomed to help prepare and cook thousands of roti, the Indian flat bread staple, with a host of local volunteers. The kitchen was a hum of activity as people stirred giant pots filled with lentils and the women laughed with me as I struggled to make my roti look as perfect as theirs. Peering into the langar hall I saw a great cafeteria-like room where people shared in the great meal, and everyone pitched in to the dishes. The sense of true community and care was profound. Accept prashad if it is offered to you. Prashad is a small sweet which is a sanctified offering served to every person who enters the gurdwara. It is customary to eat it with your right hand. If you do not wish to eat it, it is disrespectful to refuse it or throw it away, so it is best to accept it and take it with you. I stepped out of the Sikh temple and back onto the dirty, noisy streets of New Delhi with a feeling of lightness and joy. As I traveled on in India, I encountered many Sikhs, all of whom were very approachable and kind to a stranger like me. I related how much I had enjoyed learning a bit about their traditions in visiting a gurdwara, and without exception, they were happy to further the connection. If you have the opportunity, a visit to a Sikh temple is a rich travel experience. Planning to visit a Buddhist temple? Here’s some tips to do so respectfully.